For Thai curry lovers like myself, I cannot think of any Thai curry better on a hot summer day than Phuket Red Curry Shrimp with Pineapple – Gang Kue Sapparod – แกงคั่วสับปะรด. Your Seattle summer will become a tropical paradise escape when you savor this summery curry. 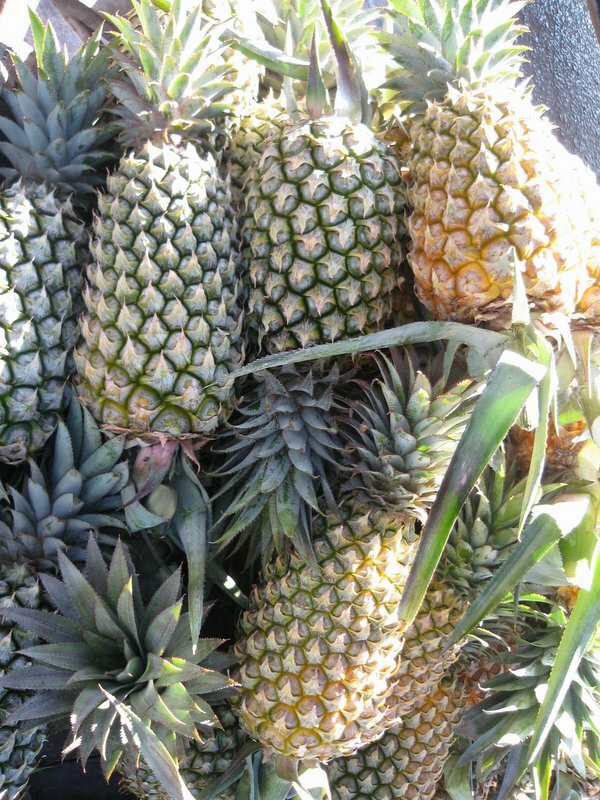 Pineapple is native to South America, but it finds itself at home throughout tropical climates such as Hawaii and the countries of Southeast Asia. Growing up in a village in Phuket, Thailand, I believed that it was native to Phuket because I saw it everyday on the plantation, on the mountain side, at the roadside stand, and at the market. My family served a few kinds of pineapple dishes every week. 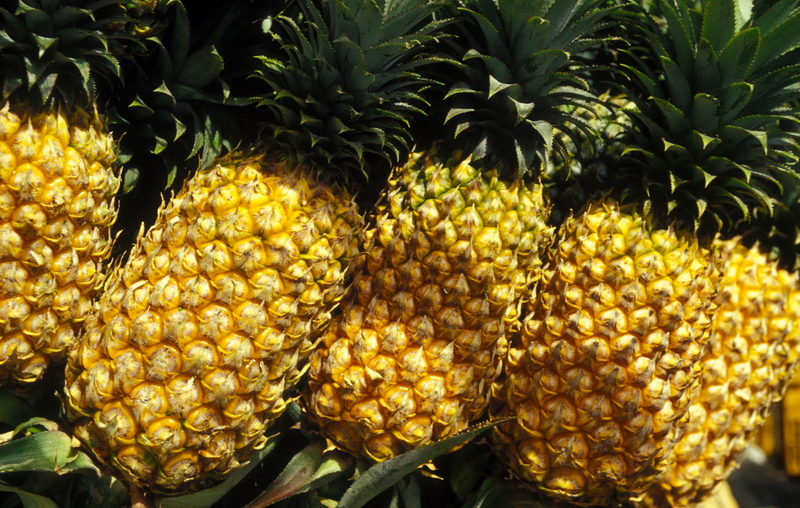 In a later post I will share with you more stories and pictures of Phuket pineapple. A juicy fresh pineapple is ideal, but when fresh ones cannot be found, canned pineapple is a good substitute. 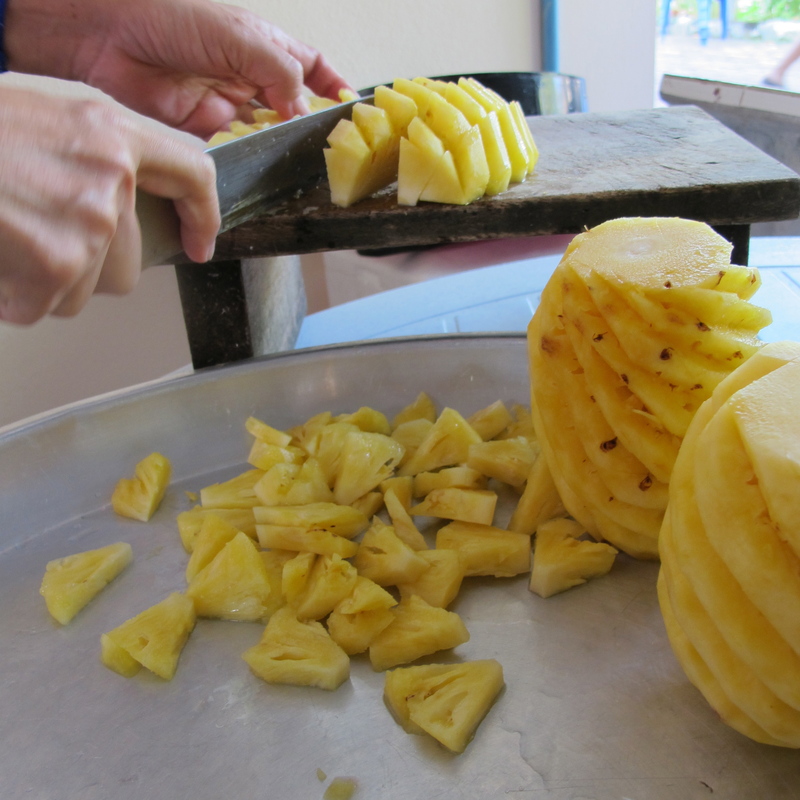 If you use fresh pineapple and want to learn how to peel it, here are a few pictures from my past travels. Please give it a try. 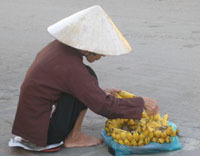 Many countries in Southeast Asia such as Vietnam, the Philippines and Thailand, practice this same preparation technique. We leave the stem to hold onto, remove the peel and the eyes, then remove the stems. The photo below is from my trip to Vietnam. After peeling, remove the eyes using diagonal cuts, and then cut off the stem. Next cut the fruit into wedges, removing the core, and cut them into chunks the preferred size. The photo below was taken in my village during the preparations for my uncle’s birthday party. What makes this curry summery is the addition of the pineapple. It adds a fruity flavor that is both sweet and sour, which cools down the spiciness without cutting out the delicious spices and herbs. This recipe is for my childhood dish—my hometown Phuket Shrimp Curry with Pineapple. Pineapple—fresh or canned—adds a delicious fruity sweet and sour balance to this dish. The marriage of the fresh Kaffir lime and cilantro leaves make the dish so perfect on its own. Coconut milk is there to add flavor and balance and a hint of spice. If you have time, I recommend you use my aunt’s Phuket Red Curry Paste Recipe for the best results. For a local or seasonal touch, local mussels would do really well instead of shrimp. And if you want to give it a try, a firm ripe peach at the end of the season creates a nice farewell to the summer as well. In a medium size pot, on medium-high heat, stir canola oil and red curry paste together until fragrant. Stir in ½ cup coconut milk and cook until oil separates from the curry paste. The color of the oil should be red. Stir in the remaining ½ cup coconut milk and the water and bring to a boil. Add crushed pineapple with juice, pineapple chunks, sugar and Kaffir lime leaves and let cook for 2 minutes on high heat. Then stir in shrimp and let cook until the shrimp are pink, curled, and opaque in color. 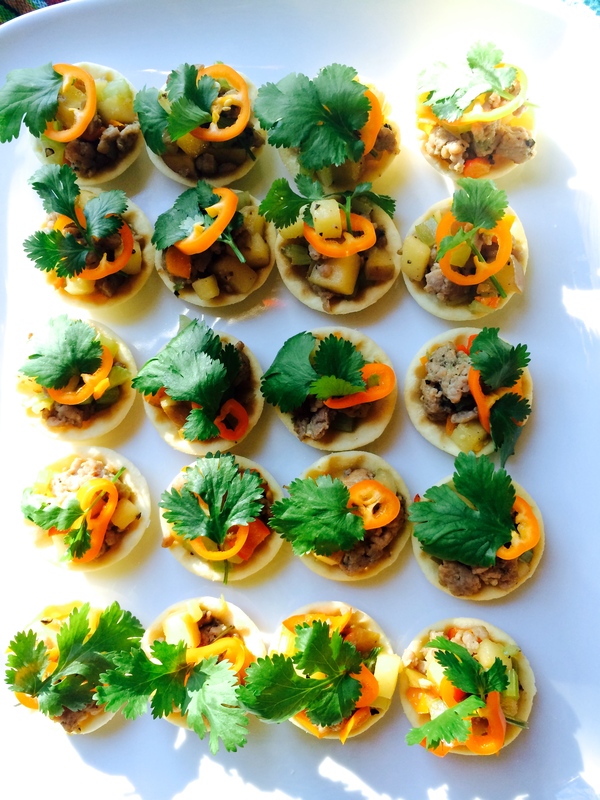 Garnish with cilantro. Serve right away with steamed jasmine rice.